The Freedom From Religion Foundation is taking Senator Marco Rubio (Fla.) to task for regularly tweeting bible verses. Rubio uses the popular social media website, on which he has nearly three million followers, to communicate with constituents and keep them informed about his official duties as “US Senator for Florida,” as the account biography describes him. Rubio is not tweeting “an errant bible verse or two, but more than 60 bible verses in three months. That’s enough verses to tweet the entire Book of Jude. Twice,” writes FFRF’s Director of Strategic Response Andrew Seidel, also a constitutional attorney. FFRF’s letter lays out a compelling case, based on copious legal precedent, that government actors are not confined to making official statements only from one platform, and that Rubio’s personal Twitter account would be perceived by readers as primarily a platform to update Rubio’s senatorial duties. The simplest solution “is to stop tweeting bible verses or any other religious message,” FFRF suggests. Either that, or Rubio can remove all traces of his public office from the @MarcoRubio Twitter account. Adding a little religious authority to appeal to the good senator, FFRF concludes by suggestiong that Rubio might consider rereading Matthew 6:5-6, in which Jesus condemns public displays of piety. FFRF, a national state/church watchdog, has more than 29,000 members nationwide, including more than 1,400 Florida members and a chapter, the Central Florida Freethought Community. For the full news release see FFRF Rubio News Release. 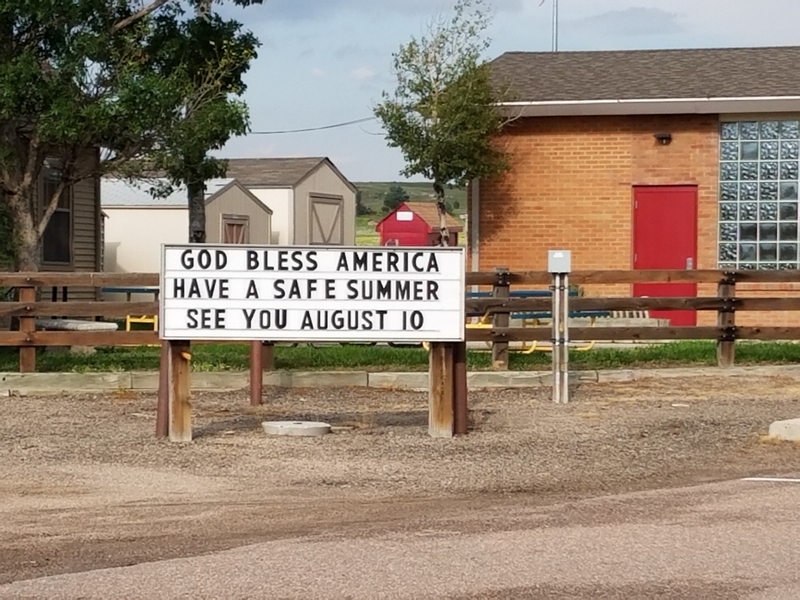 Cherry Valley Elementary Elementary, part of Douglas County Colorado public schools, has posted a sign saying “God Bless America”. Religious displays are not permitted in public schools. Courts have continually held that school districts may not display religious messages in public schools, including crosses, the Ten Commandments, bible verses, bibles, religious figures, portraits of Jesus, etc. even if privately paid for. Cherry Valley Elementary principal Nancy Wortmann & Superintendent Erin Kane have been contacted by the local Freedom from Religion Foundation. Here is a link to the Top 10 School Violations.